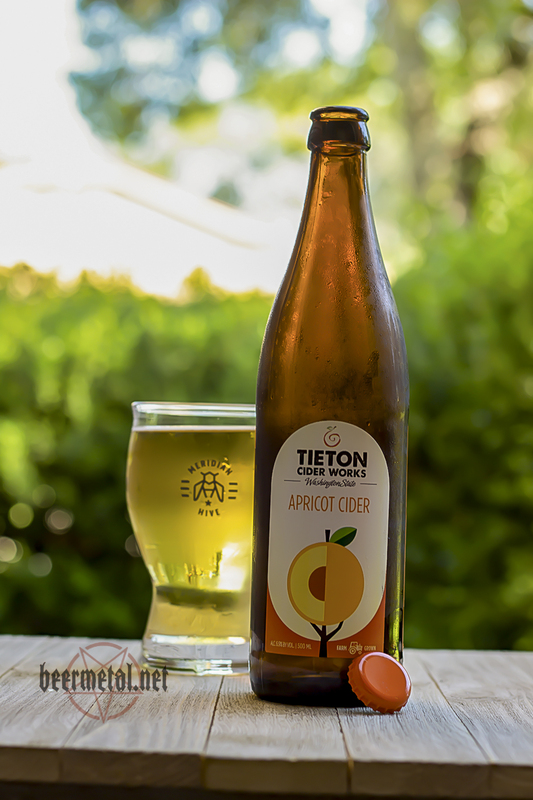 I am familiar with the Ciders by Tieton Cider Works. I have had the privilege of tasting 3 different flavors since 2013. I know that’s not a lot, but hey, I don’t drink ciders everyday, like I do beer (Well, not everyday, but I think you get the point!). I actually have had this particular one as well, before drinking it for a review here for the site. I really enjoyed it the first time I had it, so let’s see what my thoughts are now. Poured into a Meridian Hive Meadery logo glass, the look of Apricot Cider was bright golden and clear. Very refreshing looking. That kind of look that makes your mouth water just upon gazing at the glass. The aroma is a nice combination of crisp bitter sweet apples, tart apricot, white wine or champagne. The taste is exactly the same. Right up front, the flavors of the bitter sweet apples hit the palate. That’s followed closely by the tart apricot. At the end of each drink I took, it felt like I was drinking a sweet and dry white wine or champagne. The body was light with a dry mouthfeel and finish. Mild carbonation was present, giving this cider a bit of a sparkling white wine feel. Overall, I was impressed by this cider. It delivered on it’s promise of flavors, and that is exactly what I look for when reviewing these drinks. It says apricot, and I got apricot. It is a cider, and I got apples. So far, the three different flavors I have tried from Tieton have all delivered on this, so I am really looking forward to hopefully trying other flavors provided by this Yakima, Washington cider company.